BOURBON — Triton football moved to a 2-0 start for the first time since 2008 with a 22-14 victory over Hoosier North Athletic Conference foe LaVille Friday in Bourbon. James Snyder’s 24-yard touchdown pass to Delano Shumpert snapped a 14-14 tie in the second quarter, Max Slusser ran in the two-point conversion, and the Trojans made it stand up through a stalemate second half by the HNAC competitors. Snyder finished 6-of-11 for 107 yards and three touchdowns — all Shumpert receptions — compared to just 14 passing yards by the Lancers. 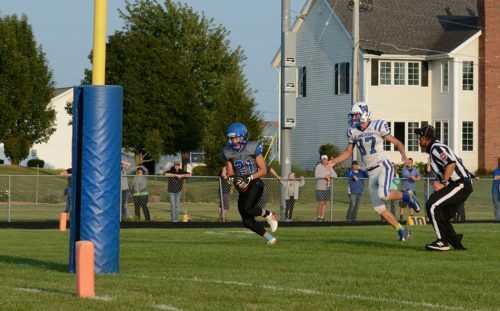 Snyder also led Triton’s rushing game with 61 yards on 13 carries as the Trojans held a slight advantage on the ground with 150 rushing yards to LaVille’s 141. Slusser recorded 54 yards in 19 carries, and Ethan Berry finished with 31 yards on five runs. Shumpert finished with 78 receiving yards on three TD catches — receptions of 16 and 38 yards in the first quarter and the eventual game-winner in the second. Drew Stichter made a pair of catches for 23 yards. Tye Orsund recorded eight tackles to lead the Triton defense, and Snyder and Slusser finished with five apiece. The Trojans also finished with just five penalty yards in a cleanly-executed game which saw the team already match its win totals from the past two seasons. Kolby Watts recorded the bulk of LaVille’s rushing yardage with 91 yards in 19 rushes, including a 30-yard run that knotted the game up at 14-all in the second quarter. He also scored the Lancers’ first TD with a 90-yard kickoff return in the first period. LaVille slips to 1-1 with the loss. Triton continues HNAC play with a home game opposite Caston next Friday at 7 p.m.